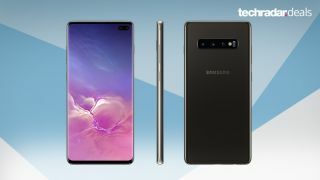 After plenty of Samsung leaks showing off many details of the Galaxy S10, S10 Plus, and more, we've got finally got the official look on the newest devices from Samsung. The Galaxy S10 Plus is the biggest, highest-specced version you'll be able to get until the Galaxy S10 5G launches. Since the Galaxy S10 5G will have limited-time exclusivity with Verizon, the Galaxy S10 Plus is likely to be a top contender for most shoppers looking to get Samsung's best offering with a big screen. It has a new processor in the Snapdragon 855 (or the Exynos equivalent depending on your region) chipset, dual front-facing cameras for depth effects, and triple rear cameras (wide, ultra wide and telephoto) for flexibility that will surely improve the Samsung camera experience. Then there's the 6.4-inch Infinity-O display, which offers an incredible 93.1% screen-to-body ratio. With all that, the Samsung Galaxy S10 Plus won't come cheap, unfortunately. But we've got the details on deals from mobile carriers that can help by spreading out the cost of the devices over months and years, get you a discount, or perhaps score you some freebies. Samsung is even offering up to $300 back if you buy your S10+ through them and trade in your old phone.